We utilise the latest stock management system, which can be linked to your own SAP system or similar platform. By utilising inventory management solutions, we are able produce a wide range of reports involving Goods Inwards, Stock Management and Goods Despatch. This includes the management of stock using either First in First Out Principles (FIFO) or similar systems. Using this system, pick requests can be received directly into our system with the warehouse pick instruction being generated, and even the despatch note. This ensures an efficient system in terms of both cost and quality. A whole range of reports can be automatically sent to you on a daily or weekly basis. 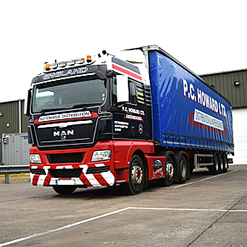 By investing in stock management systems, PC Howard are able to receive your product, break it down and have it picked into consignments for delivery to your chosen destination in a quick, accurate and efficient manner, saving time and cost. As a company we continually invest in the best systems to ensure that the services we provide are second to none.